I have to admit that I wrote that without having a real good look at the Japanese data and before I had written about decomposition of inflation between demand inflation and supply inflation. So when I read George’s comment I decided to have a look at the Japanese data once again and do a Quasi-Real Price Index for Japan. The graph below tells the Japanese deflation story. The graph shows that George is a bit too “optimistic” about how long Japan have had a productivity norm – while George claims that this (unintended!) policy started in 1999 that is not what my decomposition of Japanese inflation shows. In fact Japan saw significant demand deflation until 2003. That said, the period 1999 until 2008 was clearly less deflationary than was the case in the 1990s when monetary policy was strongly deflationary and we saw significant demand deflation. However, it is clear that George to some extent is right and there was clearly a period over the past decade where monetary policy looked liked it followed a productivity norm, but it is also clear – as George states – that from 2007/8 monetary policy turned strongly deflationary once again. Overall, I am pleasantly surprised by the numbers as it very clearly illustrates the shifts in monetary policy in Japan over the past 30 years. First, it is very clear how Japanese monetary policy was tightened in 1992-93 and remained strongly deflationary until 2002-3, In that regard it is hardly surprisingly that the 1990s is called Japan’s “lost decade”. The fault no doubt is with Bank of Japan – it kept monetary policy in a deflationary mode for nearly a decade. However, in March 2001 the Bank of Japan announced a policy of quantitative easing. For those who believe that QE does not work they should have a look at my graph. 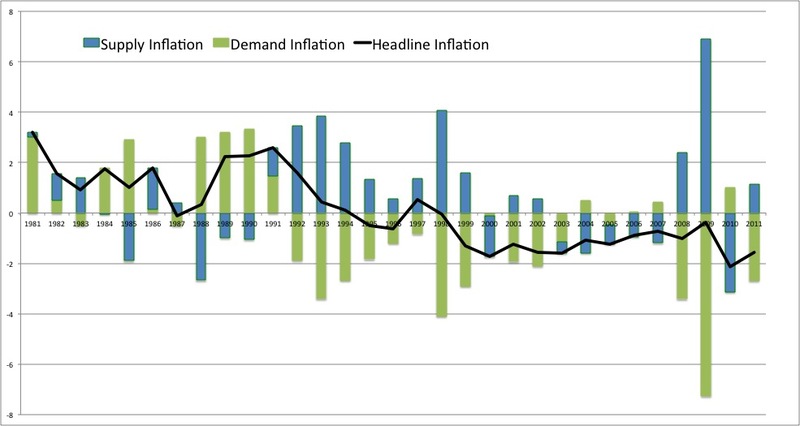 It is very clear indeed that it does work – and from 2002 demand deflation eased off. This by the way coincided with a relatively strong rebound in Japanese growth and the Japanese economy kept on growing nicely until the Bank of Japan reversed its QE policy in 2007. Since then deflation has returned – and once again the Bank of Japan is to blame. But once again George Selgin is correct – yes, we continued to have headline deflation in the period 2001-2007, but from 2003 this deflation was primarily a result of a positive productivity shock. In that sense the Bank of Japan had a period where it followed a productivity norm. The problem was that this was never a stated policy and as a result Japan was once allowed fall back to demand deflation from 2007. Do you mean that Japan saw significant demand deflation until 2003? Oops JP – you are right. Thanks.Will correct it asap. I visited Japan five years ago and was surprised by the prosperity I saw. I’d been conditioned by economists to believe that Japan was a basket case. The contradiction between what I was reading and what I saw first hand can be in part explained by your posts on this issue. JPK, I completely agree – living standards are certainly very high Japan and I have the same experience from visiting Japan. Check out Richard Johnsson’s paper Deflation and Japan Revisited. Unless my memory fails me, it discusses data relevant to the productivity norm. Jonathan, that is excellent. Thanks a lot – I hope I will find time to read the paper in the coming weeks and then I might do a post on it. Japan’s manufacturing output has slumped 20 percent since 1992 (the USA’s doubled in this same time frame). Japanese stocks are down 75 percent, and real estate down 80 percent. This is abject failure–doubly so for a nation with a disciplined and educated work force, and that at one time (1990) was regarded as the future leader of the world. Theo-monetarism, or tight money, simply does not work. The yen has soared in value in this time frame. Yet Japan has been the sickly child of Western economies. Japan’s central bank might as well be a criminal enterprise for the harm it has inflicted on Japan. Who knows? Maybe the yakuza are long bonds. BC, it obviously correct that Bank of Japan has failed, but the period that the BoJ did QE it actually worked – and demand deflation disappeared and growth returned. But yes BoJ has failed – the fact that we have had demand deflation in 15 of the past 20 years demonstrates that. And then again I do certainly agree with JP Koning that Japanese living standards are very high – despite failed monetary policies. Regard the market performance it could interesting to have a look at the performance of the Japanese stock market in the period when demand inflation turned positive. Lars–The Japanese have high living standards due to their excellent culture. Crime is low, and they spend almost nothing on national defense and only four percent of GDP on healthcare. This frees up much income for regular living. (The US spends about 16 percent of GDP on health care, and 6-7 percent on defense–so you see, the Japanese get nearly a one-quarter boost in disposable income, so to speak). There is much USA can learn from Japan, especially in the delivery of health care and national defense. But monetary policy has been a noose around their economy’s neck—and I understand they may have done better when they did QE. As Sumner points out, QE alone is not as good as QE with clear targets. BC, I completely agree – QE without targeting is not a very good idea and that has certainly been a problem in Japan. Furthermore, Bank of Japan has failed to reintroduce QE and as a result is back in a situation with demand deflation. Lars, this new post by Krugman reminded me of your post, in particular the one from December that you link to above. Note how GDP is adjusted by worker, therefore standardizing for demographics.